ARE you ready? Because knowing the world means getting hurt. Being in the world, acting, loving…this leads to getting hurt. That doesn’t mean that acting and loving are unsafe or bad things to do!!! Quite the contrary. But it means that we may have to take a bodhisattva-like attitude toward pain, and be willing to be hurt for the sake of all sentient beings (you don’t have to be a Buddhist to do this–all you have to be is a person who cares). And it is, in fact, possible, to purify your pain and make it hurt less or have less of an edge, if you take that pain and offer it to all beings, as a dedication. Be careful not to misunderstand what I am saying — this is not a teaching of masochism. It’s NOT a matter of seeking out pain. It’s a matter of dedicating all actions and feelings, not just the pain but also the joy, for the sake of all beings. This practice can do a lot to make our lives feel quite a bit better. It lifts us into a different perspective. It soothes the pain out of our hearts. And it causes the obsessive Ten of Swords thoughts to transform into the peaceful resolution of the King of Swords, shown here sitting in a violet cave, not only peaceful and resolute, but having achieved that peace through having been pierced by the Ten of Swords and having worked through it to find the real truth of the matter. And the real truth of the matter is multiple in nature, no matter what the cause for your pain. It’s (just for starters) 1) nobody ever really truly intends to hurt us in the way that we were hurt, first of all, and 2) all pain, no matter what the cause, is a door that we can walk through to find enlightenment, truth, and wisdom, if we choose to. How do we walk through pain to find this wisdom? The answer is on both these cards: meditate. 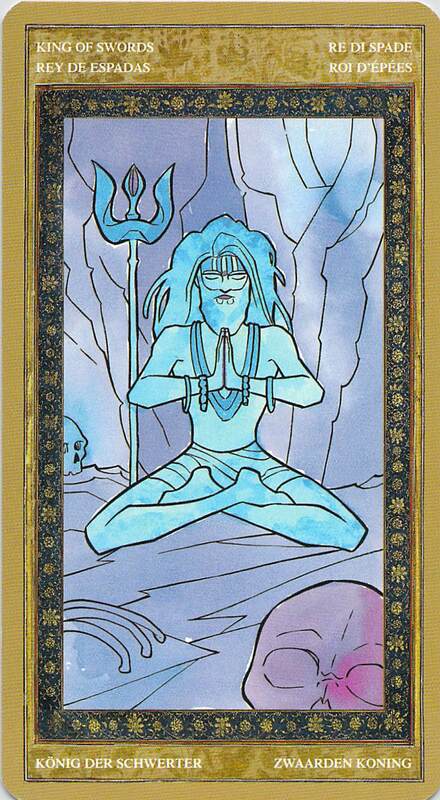 Further advice, also on the cards: ground and root energetically into the Earth (Ten of Swords). 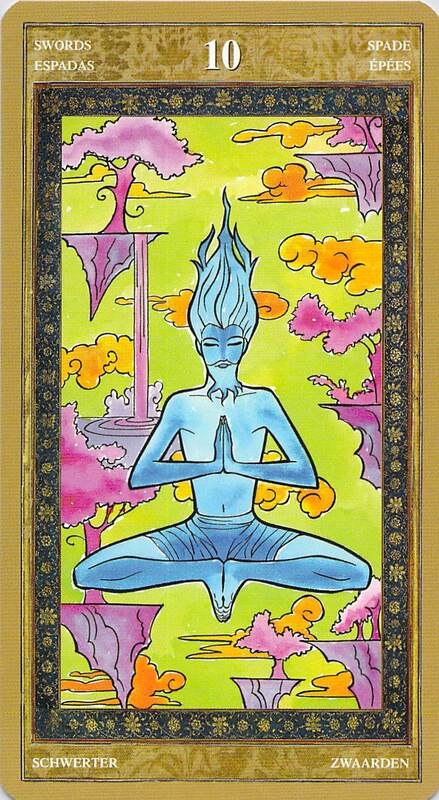 Let your thoughts and feelings flow like a waterfall (Ten of Swords). Be protected and supported by Earth so much that it’s as if it were surrounding you like a cave (King of Swords). See where that gets you. Reblogged this on Le Belle Amour. Thanks for the reblog! That was so sweet of you!